The differences between left and right have increasingly become a matter not of differences in opinion but in differences in facts which are accepted. This has been studied the most with regards to science, with conservative belief in science now hitting new lows. This has also been commonly seen with high profile issues ranging from false conservative beliefs that Saddam threatened the United States with WMD or was involved in the 9/11 attacks to their false beliefs that Barack Obama is a Muslim, a Socialist, and someone born outside of the United States. Conservative rejection of science is most striking to those who understand that science is the best way to study the world around us based upon verifiable facts, but Republican anti-intellectualism is not limited to science. They promote a revisionist history to justify their policies, and promote economic views which have no basis in any sensible economic theory, even ignoring the actual economic views of capitalist economists they claim to follow. If Adam Smith were to come back to life, he would die laughing over the economic views which today’s conservatives promote, often claiming they are based upon his views. 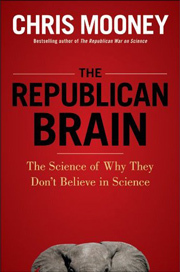 Chris Mooney, who has written a lot on this topic, has an article in Mother Jones coinciding with the publication of his new book on The Republican Brain. Studies have shown biological differences between conservatives and liberals. These differences certainly might have some influence as to the ideology someone holds, but I suspect that this is something influenced by both nature and the influences on an individual. Therefore we see far more liberals on the coasts then in the deep south. Kevin Drum raises the question of why American conservatives are more anti-science than those in Europe. Similar questions could be raised based upon time. At some times, such as during the McCarthy era, conservatives were as fanatic as those today, while at other times the bulk of the conservative movement tended to be less extreme. William F. Buckley, with all his faults, would probably have tried to keep the Tea Party followers out of the conservative movement as he did with the Birchers. Barry Goldwater was so repulsed by the direction that he saw the conservative movement moving that he considered himself a liberal in his later years. If Ronald Reagan were still alive and alert I suspect he would do the same. I think this also comes down to the importance of environment impacting on possible biological factors. While other factors are at play, there are two main characteristics of today’s conservative movement which makes them more likely to reject facts. First, the conservative movement consists of alliances which have a vested interest in ignoring facts. This ranges from the religious right to those being duped into denying science change to support the interests of the petroleum industry. Secondly, today’s American conservative movement has a propaganda machine which might be powerful than has ever been seen in human history, with the ability to get conservatives to internalize and spread beliefs which are totally irrational. Fox has been far more successful in promoting misinformation than the propaganda machines of Hitler or Stalin. In many ways the American conservative movement is far closer to the authoritarian movements of the 20th century than to any beliefs held in the past by Americans. Unlike Hitler and Stalin, the conservative movement does not need to eliminate the trappings of democracy when they can fool their followers into thinking that they are promoting freedom and limited government. Orwell certainly saw this coming.